By Gary Sandiford, Olive Group‘s Dubai-based assessments manager. Olive Group is a leading provider of security and technology solutions and has operated continuously in Iraq since 2003. Olive Groups Iraq statistics are drawn from multiple sources, including media reporting and direct liaison with in country assets. Included within the statistics is a degree activity which may not be directly attributable to insurgent/terrorist groups, such as murder, kidnappings and other incidents that may equally be criminal in nature. The total reported number of reported incidents in Iraq for the week 25th June to 1st July was 131, compared to the previous week which witnessed a total of 117 incidents. The weekly average for 2012 including this week’s data, now stands at 103 incidents per week. Previous reporting highlighted a cycle of violence which saw two to three weeks of reduced incident levels, followed by a spike in activity. Statistical analysis over the course of three weeks has now begun to show a sustained, high level of violence. In addition to the overall increase in numbers of incidents, the lethality of attacks has also risen sharply. 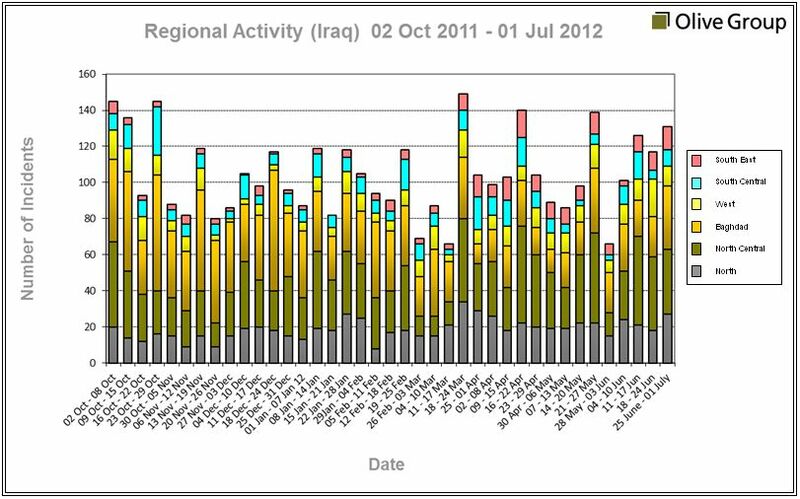 Al-Qaeda in Iraq (AQI) and affiliates appear to have maintained a tempo of high profile attacks not seen in over a year. The use of vehicle-borne explosive devices and suicide attacks continued – this week accounting for 12% of all attacks (compared to 7% in May, a month without a nationwide spectacular). For the last nine months, AQI and its associated groups have proven able to undertake major multi-city coordinated attacks every four to six weeks, a capability the organisation has not possessed since 2008. Its disparate cells are also capable of undertaking a trickle of other “standalone” attacks each week. The forthcoming (Shiite) Shaabaniya pilgrimage in Karbala presents an ideal target for sectarian attacks*. *At the time of writing and not included in the above statistics, the 3rd July witnessed several car bomb attacks which appear to have been targeted against Shia pilgrims gathering for Shaabaniya. One car bomb was reported the city of Diwaniyah in Qadisiyah province, two were reported in the city of Karbala and twin blasts were reported in Taji to the north of Baghdad. Initial reports also indicate that an explosion occurred on 4th July in a market in Zubaidiya, a mainly Shia town 60 miles southeast of Baghdad.